Ho, Ho, Ho and Jingle Bells! You hear these sounds before any Christmas eve in every shopping mall and on every street corner. From the USA to Europe, Santa Claus, is winning the hearts of the children, even more than the Christ child, which is sadly associated with El Ninjo weather phenomenon. The age-old myth, highly styled by Harper’s Weekly author Thomas Nast, is coming home, but no one seems to realize its origin, which once was an expression of star lore in a long-lost language and worldview. The thread of thoughts and web-patterns of lost cultures are blown about by the winds of change, and there are left only ethereal fairy tale figures, whose images are remodeled by clever marketing strategies to use as subliminal sales tools. It is difficult to differentiate Santa Claus folklore of recent origin and that of long duration, as it is with most myths, as it is with any story that is told and retold, changing with each person who repeats it. Santa’s image is deep, but always points to the North. “The recent mythology we call science”, says Anthony Aveni in his book Dialog with Stars, means the transience of any knowledge, but also explains how difficult it is to find the true, underlying facts under the modern kitsch-overloaded myth. 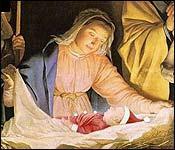 The true origin of Santa Claus (German: Weihnachtsmann -- Holy-Night-Man) is explained literally. Even children point to the sky if you ask where Santa Claus on his sleigh comes from. In old Dutch, the origin of "Sinterclaas" is to be found in the starry sky, where in North European star lore he played a major role long before Christianity. Neither Christianity's infant Jesus, nor communist Father Frost, nor the modern figure of Grinch (a parody of Ebenezer Scrooge from Charles Dickens' A Christmas Carol) could damage Santa; only the precession of the equinoxes has shifted him tropically, as the following research into his origin will show. The character of the Santa was superseded in Christianity by the figure of the bishop of Asia Minor, Nicholas of Myra, one of the fathers of the Nicean council (325 CE) and an important Saint of some Christian churches. His name day is celebrated on Dec. 6th when, on the evening before, he comes bringing gifts to the children who say their prayers properly. St Nicholas is accompanied in the Eastern Alps by a black devil who has a cane to punish bad children. This day is 73 days (two and one-half months) after the autumn equinox and finds its parallel in the fairy tale of Hare and Hedgehog, Groundhog Day, and some symbols in an old rural farmers calendar in Austrian and other ancient lunar calendars. The figure of Santa Claus, however, appears on Christmas Eve, mostly coming down the chimney bringing gifts to the children. Because he has such a strong charisma, several different factors are working together. Let us focus on some of his characteristics and attributes. The function of a bell is always to announce by ringing at specific times or purposes, for example, a fire alarm bell. The bell of Santa obviously is announcing or ringing in something. In this case it is Holy Eve on the winter solstice. It is interesting that the English term, watch or time itself, is related to the German word Glocke (bell). The name of Santa Claus is said to derive from Nicolaus (Greek: victory and people), but also the Latin “claudere” (close, lock) or even “claudus” (lame) could be hidden in it. The first would fit Santa (closing the Old Year and unlocking the New Year), the second would fit to the horseshoed demon-companion, like Hephaistos and Mephistos with his lame foot, as we will see later. That the terms Santa and Satan equal each other by exchanging only one letter suggests that they are closely related as it happens often with great antagonists. The Dutch Sinterclaas might etymologically be related to Sintflut (deluge) which in ancient starlore represented the flood of stars of Milky Way as we will see later. The shaft or chimney through which Santa comes when invading the houses and the use of a bell gives a hint that he is announcing something deeply hidden. The motif of the chimney is also found in the chimneysweep, who, similar to Santa Claus, is seen as a bringer of good luck at New Year. But the flue also points to the celestial smith, Hephaistos/Vulcan, or the demiurges in the Ogygian cave of Saturn/Chronos, from which Satyr and Satan etymologically and astromythologically derive. Let us focus now on the chimney, which appears as a metaphor in many myths, fairy tales, and visions. In one old English tale, a couple of cats meet in an old ruined house, where they are observed by a man without being seen by the cats. One cat jumps on the wall and shouts: “Tell Dildrum that Doldrum is dead.” The man goes home and tells these events to his wife. Suddenly the house cat jumps up from his spot by the fire and yowls: “Now I am the king of cats!” He then vanishes through the chimney. [Rev 9:1-2] And the fifth angel blew his trumpet, and I saw a star fallen from heaven to earth, and he was given the key of the shaft of the bottomless pit; he opened the shaft of the bottomless pit, and from the shaft rose smoke like the smoke of a great furnace, and the sun and the air were darkened with the smoke from the shaft. The motif of the shaft or open pit is similar to that of the well, which in the metaphoric language of the ancients was seen as the way to the underworld, "downunder." The smoking oven of the Apocalypse finds its celestial representation in the constellation Ara, the southernmost constellation visible in the Mediterranean region. Michael Scotus called the constellation Altar "puteus sive sacrarius" (source or altar). It is the holy well as a symbol for the way into the underworld and is depicted by Calypso, the "hiding nymph" on the "downunder" island of Ogygia. The legend of the basilisk fits into this pattern, in which a kite with the head of a rooster waits at the bottom of a deep well. Then we have the beautiful old Grimm's fairy tale of "The Blue Light" or "Mother Holle", who is also called Frau Berchta. The way to Mother Holle is through a well. The metaphors of the well seem unfathomable. There is a history from Gervasius of Tilbury that the Star of Bethlehem fell into a well pit at Bethlehem after it had fulfilled its function of lighting the path of the magis. The Ka'aba of Mecca, a giant black cube, which faces the black stone, a meteor framed in silver, is likewise built on such a well, whose edge once showed a cube. Before Islamic times, this well was a sanctuary of Hubal, a god equated with Kronos/Saturn. 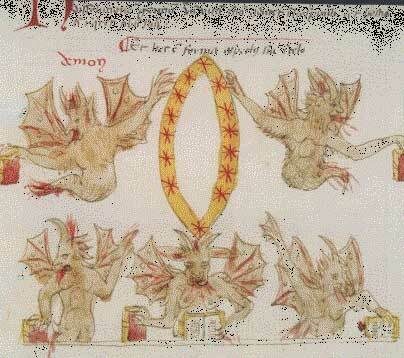 The cubus is a symbol of Saturn, the old Christian Satan: Incubus. On the constellation Ara, the altar, which formerly was called a well, according to Eratosthenes, Zeus swore his oath, before he attacked his father Kronos and threw him off his throne and out of the heavens, thus usurping the rule of Olympia in the first mythical dawn of gods and turn of an era of the ancient Greeks. It is the mythical base of the Olympiads - the Greek time calculation. An enigmatic comment about the shaft of seven wells or the well of an oath is also mentioned in Genesis: [Gen 21:31] Therefore that place was called Beer-sheba; because there both of them swore an oath. [Gen 21:33] Abraham planted a tamarisk tree in Beer-sheba, and called there on the name of the Lord, the Everlasting God. The metaphor of the shaft is similar to many fairy tale caves, which often magically open and give free treasures or bewitched princesses or make the hero a king or emperor. We will shine more light on one of them later. 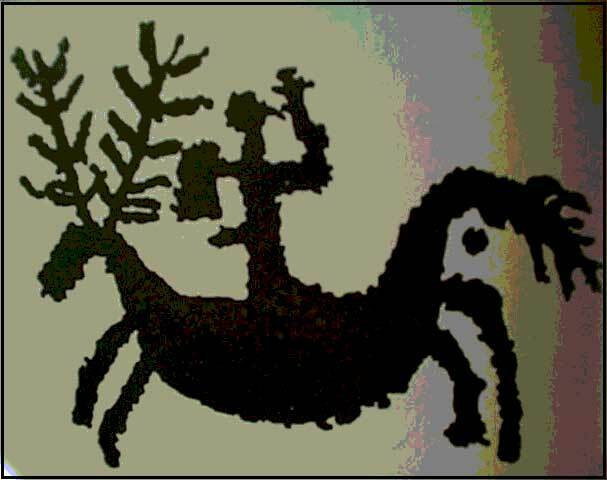 An unmistakeable attribute of Santa Claus is his sledge, which we find depicted in uncountable Nordic petroglyphs, often loaded with a tree or a Sun symbol. German archeoastronomer Ralf Koneckis plausibly shows in his book Mythen und Märchen. Was die Sterne uns darüber verraten (Myths and fairy tales. What stars reveal) that the sledge represents the constellation of Gemini, which from 8000 years until 6000 years ago, due to precession, was the constellation of the Northward Spring Equinox and therefore announced the vernal Sun. Koneckis links linguistics and astronomy to demonstrate that the sledge was the former spring constellation Gemini in which the sun of the new year rises to new life like Snow White (Schneewittchen) in her glass coffin. 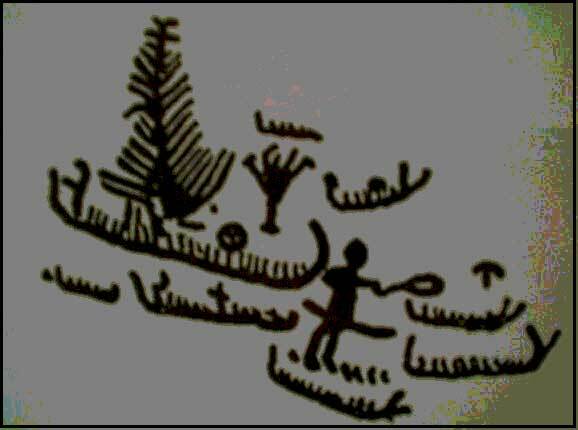 The tree that is carried by Santa Claus may be found in old petroglyphs as well as in rural tradition at the spring equinox or on May 1st. A calendrical connection to both of these dates is found not only at the beginning of spring in the common calendar (now March 19th – 20th) and Beltaine in the former spring festival in the Celtic calendar (May 1st) but also the name day of Jesus' father Joseph, whose feast is liturgically celebrated on both days. Behind the erection of a stake monument at the cardinal points of the year, e.g. the Yule-tree, is the idea of showing that celestial movements are involved in calendrical rule on earth. The erection of columns, pillars, gnomons, or obelisks to function as calendars or clocks is very old, but they provide a ritual symbol of power, as shown by the Washington Monument in Washington, D.C. The former sundial of Emperor Augustus in Rome and the Egyptian obelisks, which in ancient Egyptian literally were called “petrified rays of sun” and whose shadows on the ground were used to read the time and date, are such relics, sadly now only tourist attractions or status symbols. The sledge of Santa Claus is pulled by at least one stag or reindeer called Rudolf. A view to the constellations and a comparison with a presumably old, but modernized German poem of unknown origin, gives further calendrical and astronomical hints that the “Holy Eve Man” comes from the sky, but in respect of his due-to-precession shifted seasonal position. zählen wir dem Winter zu. stellen uns den Frühling dar. sind des Herbstes feste Stütz. we count to the winter. are the frame of autumn. These verses first of all describe the 12 positions of the sun in its seasonal run by using symbols, but the symbols agree only partly with the constellations of the zodiac as we know it. The solution of this riddle is that in northern cultures, some constellations had different names and images than in the Mesopotamian and Mediterranean zone. Only the archer (Sagittarius), human-pair (twins / Gemini) and corn-ear woman (Virgo with Spica) are easy to recognize. Their seasonal positions indicate a very old age for this poem. However, the Sun is not in Gemini at spring now, nor it is in Virgo at summer, nor in Sagittarius in autumn. Now the sun in July passes through the constellation Gemini; at the beginning of autumn it is in Virgo; and at winter solstice, in Sagittarius. The shifting of seasons relative to the constellations, due to precession, must be the reason that this verses are not correct any longer. If we take the average formula that every 2000 years the cardinal points shift by one constellation, we come closer to the solution. From about 4000 to 2000 years ago, this rhyme would have agreed with the constellations, but now they agree only with the zodiacal signs or astrological houses, which are not linked with the constellations of the ecliptic, but to the celestial equator, and therefore don’t shift seasonally due to precession. We know definitely from old Northern mythology and astrology that there were no constellations like Scorpio or Leo, presumably because such animals where not known there, but, as shown by Koneckis in his astronomical fairy tale analysis, their places were occupied by animal symbols like stallion (instead of Leo) and stag (instead of Scorpio). The stag-horned, three-faced God Cernunnos, after which years are named and counted, is a well-known representation of this constellation. To guide the reader now to the right path we give the hint to Milky Way. It stretches over the firmament as a white band in which Cygnus, Cassiopeia, and Auriga are the most ostentatious constellations. This white band runs across the path of the sun, the ecliptic, at two positions: at one side of the zodiac between Gemini and Taurus, and between Sagittarius and Scorpio at the other side. We see that the white band of the Milky Way, high across the firmament, connects the fairy tale constellations of sledge (Gemini) and stag (Scorpio). Thus we have found the key to the origin of Santa Claus and can identify Rudolph the rednosed reindeer with Antares, the red shining main star of Scorpio (stag). Actually the fable character and its name Rudolph was invented about 1950. There are other mythic hints, like Grimm’s Fairy Tale: The Glass Coffin, in which a tailor gets lost in the woods but is saved by a stag, which kills a bull before his eyes. The stag carries the tailor to a wall of rock, behind which a beautiful maiden is kept in a glass coffin, bewitched by a magician who was masquerading as the bull that was killed. Using the constellations, this fairy tale tells of the awakening of the spring sun 8000 - 6000 years ago, at an age when, due to precession, it still was in Gemini (sledge or coffin). Now, however, the sun is located in Gemini at the beginning of summer, because the seasonal cardinal points have shifted by three constellations due to the wobble of earth’s axis. Similar to the fairy tale of The Glass Coffin are the celestial descriptions of Russia's Tungusians: They call the Milky Way “Foot tracks in the snow of the bear”, that chased a stag along the Milky Way and spread the legs and bones of the stag left and right. Considering Santa you cannot miss his “alter ego”, who has followed him like a dark shadow since ancient times. There is a devil, called Percht, Bartl, Krampus, Knecht Ruprecht, or Rotsohler, accompanying Santa Claus in the European Alps. He shows the pre-Christian origin of this custom as a daemon trabant, who wears a costume with horseshoe, basket, and chains, acting as a traditional symbol for the coming of winter. At some rural places in Austria’s Styria, people still play at Krampus game in the theatre and show his origin from former God Odin/Wotan, who also was the leader of the wild hunt, the wodansheer. We should mention here also another figure: Ruebezahl, a German mythical, giant-like person, who is a mixture of Krampus and Santa. I tell you, it is a very holy night! This trail of night demons in known by many names, such as the wild chase, the Swiss Saelig Volk (dead folks), and the French chasse infernale. In the former belief they are an assembly of dead souls, who appear at certain times, usually at midnight, chasing through the night with noise, dogs and horses until the cry of a rooster makes them vanish. This heavenly trail can be led not only by Wotan, but also by other characters: King Arthur, King Herle, Herlequinn, Herlethingus, Mother Holle, Holda and Berchta. Around 1200 CE Walter Map of Wales wrote the best known legend of the mythic King Herle, who once went out to war and came home with a ghost army. In art we meet this mythic character in Goethe’s poem Der Erlenkönig (The Earl King) and in Italian Commedia dell’arte as Harlekin, who wants to escape into the other world through a mirror, but also introduces the procession of the carnival. 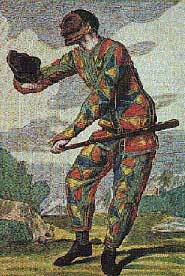 The Harlekin is a character that introduces the carnival in Europe. Carnival starts with a traditional feast at November 11th (St. Martins Day) at 11:11. Traditionally it was the last dance before spring. The first animals, the geese, as useless eaters during the long winters, lost their lives for these festivities. This original time of fasting - carnival comes from Latin carne vale (good bye flesh) - comes to its highest after Mardi Gras, 40 days before Easter. For example, the unconscious linkage of wild hunt and Santa Claus is expressed evidently and clearly in the title caricature of the German magazine Eulenspiegel. Once it was a rural custom to leave little gifts in the windows for the dead. Some farmers even left some corn in the fields as a present for the dead folk of the wild hunt. It is easy now to find the way to Halloween, when children dress up as ghosts and say “trick or treat,” demanding little gifts. In between the fall equinox and winter solstice at the beginning of November in recent calendar years, the Northern cultures once celebrated the feast of the ancestors called samuin. Like imbolc (now 2nd February), beltaine (about 1st May) and lugnasad (1st August), it is situated in the middle of the four seasons. Because these dates in former time partly depended on the moon's phase, they can move about within a space of two weeks. A short review will clarify names and origin of the festivities, but the exact reconstruction of the beginnings seems virtually impossible. These feasts arose, according to the Irish myth, from the Tuatha De Danann (tribes of the goddess Danann), who were descendents of Nemed, studied magic in the East, and invaded Ireland. The name imbolc derives on one side from oimelc (the first new milk of the sheep after the winter), but on the other side also from im-folc (to wash oneself all around), which relates to a purification ritual 40 days after the wintersolstice. Dagdae, a godfather-character of the Tuatha De Danann, had a daughter named Brigid, who as the Lightgoddess Candlema became a model for the Christian St. Birgit. Finally her feast-date was occupied by the catholic ceremony of St. Mary’s purification. Beltaine presumably has its name from the Bel-fire, incense in honor of the god Belenus. Its origin also is found in the Irish myth of the Tuatha De Danann. After landing on the island, the first battle of Mag Tuired took place, in which Beli Mawr played a major role. May feast and May trees still remind us of that tradition. Lugnasad, the late summer festival is named after the god Lug, just like French city of Lyon (Lugdunum). This feast is celebrated in honor of his wetnurse and later wife Tailtiu, who after hard work during the summer died at this time. This tradition still lives as an annual market, mountain festival, and family meeting. In ancient times, the search for a bride took place then, along with betrothal festivities and excessive and frivolous bacchanals. In German folk tradition this day is called Großer Frauentag (great day of women), and it was christianised in the Catholic calendar as St. Mary’s assumption on August 15. Samuin introduces the Celtic wintertime, and as Irish myth tells it, the second battle of Mag Tuired took place at samuin. It is called Hallowe’en in English and was reason to remember the ancestors, because then the hills of the fairies and elves were open, allowing contact with the world beyond. In the night of samuin the prophecies for the coming year were made and of course linked with sacrifice. Irish sagas tell that the king on the eve before samuin at Mag Slecht committed a ritual mass suicide with three quarters of his subjects by honoring the cult image of Cenn Cruach (bloody head). This self sacrifice would bring fertility and peace for the future. During the second mythic battle of Mag Tuired that the Tuatha De Danann left as winners at samuin the mysterious god Ogma, in Gallic called Ogmios, played a major role. His berserker-like strength, is expressed by depicting him (like the Krampus) with chains. By using a special curse formula, he could be called on to damage enemies badly. The invention of writing, using Ogham-letters, and the Highland games are attributed to Ogma. In the oldest-ever found Gallic calendar, named after the city of its recovery in 1897 CE, Coligny, samuin was also the turn of the year. The Christian feast of the dead, All Saints Day, originally was celebrated on the Sunday after Pentecost and was given its place on November 1st around 837 CE during the process of christianisation by Pope Gregory IV, in an effort to satisfy the northern customs. Recently the festival has been celebrated more and more exuberantly by people wearing masks, and the evening before is called All Hallows Eve. Halloween or All Hallows Eve and Holy Eve are related not only linguistically, but also calendrically and in memory, because the first, Samuin is at the Celtic beginning of winter, Holy Eve at winter solstice, at Christmas. Image: Cycle of the year with Celtic feasts and equinoxes and solstices. This “hingepoint” of the year, where in the northern hemisphere, the sun at noon reaches its lowest annual position and at morning its southernmost point of rising on the horizon, is manifest in many megalithic monuments, like the Teufelstein (Lucifer’s Rock) near Fischbach, Austria, whose myth is closely related to a local costumed Krampus. There is a long list of such age-old calendar structures that are oriented to locate the winter solstice. Stonehenge and the Irish National sanctuary, New Grange are only two examples. All around the northern hemisphere, the time when the power of the sun is increasing again was celebrated to honor a Kronos or Saturn-like God. At winter solstice in ancient Rome, the people celebrated Saturnalia in honor of Saturn with general amnesty, and the lords were the servants of their slaves. In the cult of Mithras which was common among the Roman legions there was held the day sacred to Sol Invictus, the Unconquered Sun in honor to the increasing stronger sun from this day on. This Bull cult influenced Christianity very much such as as is shown by the central prayer at the bull killing: "who will not drink my blood shall not be blessed" mirrored in the Xian Mass. The orientation of Mithraic sanctuaries towards the sun was also of great importance. A lot of light illusions of the sun rays were used for religious purposes. These are also found later in a lot of Christian churches. On this cardinal point (from Latin cardo = hinge) the annual feast of the birth of Christ was carried out whose incarnation (becoming flesh) nine months earlier on the date of St. Mary’s annunciation was adjusted. These two hinge points are linked by the average human pregnancy period. The Milky Way’s position in its yearly run and its spiritual meaning have been of great importance to men. Its characteristic as the home of dead souls seems to have been global and was expressed in many ways as a passage or pathway for souls. The home of the dead, e.g., in the ancient Greek/Roman mythology was entered by crossing a big river called Styx, over which the ferryman Charon guided the dead souls into Hades/Pluto. Here, the Milky Way represents the celestial water that has its source in the vessel of Aquarius. Archeoastronomically considered, the myth of the deluge tells of a time when Milky Way due to precession still was in a position that its ostentatious white band at morning of vernal equinox exactly in the East arose above horizon. Image: The band of Milky Way on Eastern horizon at morning of vernal equinox 6000 years ago. The so called zero hour RA line, the meridian from Northern celestial pole to point of spring equinox and the white band of Milky Way once overlapped. [Ps. 91:5-6] Latin: non timebis a timore nocturno, a sagitta volante in die, a negotio preambulante in tenebris, ab incursu et daemonio meridiano. [Ps. 91:5-6] English: You will not fear the terror of the night, nor the arrow that flies by day, nor the pestilence that stalks in darkness, nor the destruction that wastes at the noon. In his Latin Commentarii in Somnium Scipionis (Commentary on Scipio's Dreams), the 5th century writer Macrobius explains that the Milky Way is the abode of the souls of worthy people and describes it as an oblique circle with respect to the Zodiac. He calls it the “High Noon Devil” (daemonio meridiano), an assembly of very learned spirits (collegio spirituum sapientissimorum) one has to be afraid of (de quibus valde timendum est). Also, Michael Scotus considers the Milky Way the seat of the spirit and calls it demon meridianus seu galaxia (high noon devil or galaxy). 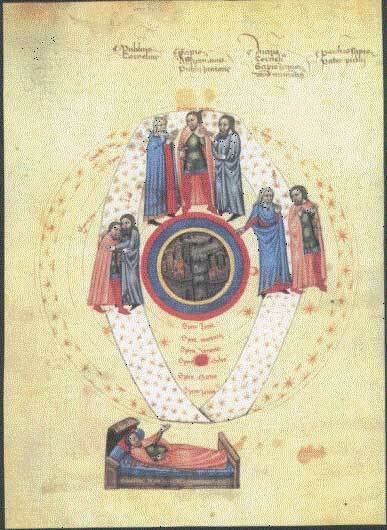 Image: representation of the High Noon Devil of the dream of Scipio in a codex of 14th cent. Many similar myths are still told about this giant animal that results with some fantasy in the outline of Milky Way. Usually we find a dog or a wolf that steals corn from a northern mill and runs away across the sky, scattering grain as he goes. Therefore the Native American Pawnee still call it the Dogway, keeping their knowledge in sacred bundles that contain star maps. Similarly, the Native American Lakota Sioux call the white band of the Milky Way the Wanaghi Tachanku (trail of the spirits). The ancient Dutch call the Milky Way Brunelstraat, after Brunel, a thieving fox. Other links are found in some French provinces where the Milky Way is still called “path of the souls.” We have already mentioned the Tungusians of Russia, where the Milky Way represents the traces of a bear that chases a stag. A similar motif is found in stories of former times in which a werewolf frightened people. The early Christian iconography of St. Christopher depicted him with the head of a dog. Image: St. Christopher with head of a dog. Even today, modern fantasy movies entertain us with the horrible nightmare of blood drinking, never-dying monsters of the other world beyond the dark forest, called Transylvania. Giordano Bruno entered the religion-oriented arena of astronomy when he first suggested that the fixed stars and therefore also the Milky Way are locations with other suns and other planets, and other men with other gods. But to burn him in a public spectacle (it was scheduled for New Year’s Day of 1600) at Campo de Fiori, Rome, will remain an everlasting disgraceful deed staining the Catholic church’s reputation. So far this short survey has covered only a few of the many images which depict the Milky Way, of which the harness between the stag and Santa’s sledge is only one. Due to the shift of the precession the former spring-equinox myth fits the recent position of the sun in winter, which stands at Christmas and New Year’s Day in the constellation Sagittarius and just touches the outline of the Milky Way. Image: Sun’s recent position at zodiac and Milky Way at winter solstice. Gemini: in ancient Arab star catalogues it has the name crib and its main stars are called in old Babylonian northern and southern donkey. Taurus: He is standing as the ox beside the crib and we find him as a Golden calf during the Exodus with Moses, the predecessor of Jesus. Aries: Shepherds were the first to visit the crib in Bethlehem and the sacrificed lamb (Agnus Dei) is still in center of the Mass of the believing Christians. Let us also realize that the story of Santa is an age-old story that children unconsciously repeat, even in modern comics: Who is the model of Bart Simpson, Homer Simpson, their dog called Santa’s Little Helper, all living in Springfield? And aren’t we always just repeating age-old myth as if we can’t invent anything new on this planet, when we build shopping malls as the new cathedrals of the economy, a word which is related to the Greek word oikoumene, meaning the houses (oikos) of the planets on the zodiac, under which is the zone of earth, where mankind is living. 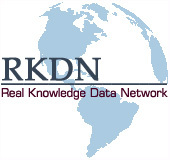 Let us consider here also that the main effort of business, booming sales, and economic trend in German is called “Konjunktur”, deriving from a term with also astronomical connotation: conjunction, the meeting of planets. What language expresses here is that business only can grow, if people are meeting at marketplaces and discussing, as the mythical Greek gods met in symposium or (Latin) conjunction, which also describes an alignment. The greatest economic boom every year - Christmas - is promoted by the advent calendar, which allows even children too young to read or count to follow by the open and closed windows the classic countdown to Holy Eve.